Pissalidière, a classic from Nice made easy from Thyme for Cooking. In the traditional Pissalidière, there are lots and lots of very slow-cooked onions, anchovies and wrinkly oil-cured black olives - with pits. If you really hate anchovies, leave them off; if you're undecided, this may convince you to like them. The feta is not traditional, but my addition. And I prefer to use pitted olives. I also sped up the cooking of the onions, but, I think, with no appreciable loss of flavor. Dissolve yeast and sugar in warm water and let sit a few minutes to 'proof' - start to look foamy to prove that the yeast is still alive. If you have a mixer with a dough hook put the yeast and all remaining ingredients in mixer bowl. Blend with dough hook attachment until well mixed then kneed for an additional 3 minutes. Put in a warm place (75F, 24C) to rise, if possible. If making by hand put yeast in large bowl along with all of the rest of the ingredients minus 1/2 cup flour. Put remaining flour on work surface, add dough and kneed until smooth and elastic - about 10 minutes. As remaining flour is incorporated dough will become less sticky. Put in warm place to rise. After dough has doubled in size, about 30 minutes, punch down. Lightly butter a pizza pan or large baking sheet. Roll dough out with a rolling pin as best you can. Then put on pan and stretch it to fit, patting it out with your fingers. If it keeps springing back wait a few minutes. Try not to put any holes in the crust. You are now ready to assemble. Slice onions about 1/4" (.6cm) thick. Heat butter and oil in large, nonstick skillet over medium-high heat. Add onions and sauté until they become soft, stirring frequently. Add herbs and stock, cover, reduce heat to low and simmer 20 minutes, until very soft. Uncover, turn heat up to medium-high and continue cooking until volume of onions has reduced by half and liquid has evaporated. Reduce heat if they start to cook too hard and/or brown. We are not caramelizing these. Cooking time should be about 45 minutes, total. When done, turn off heat, remove bay leaves and keep warm if not using immediately. Spread onions evenly over crust. Arrange whole anchovies on top of onions. 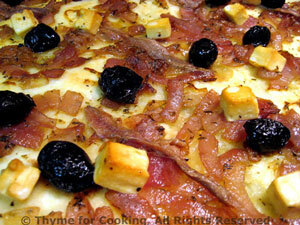 Top with whole olives and feta cubes. Bake at 450F (225C) for 20 - 25 minutes, until crust is golden brown. Remove from oven, drizzle with truffle oil if you have it, slice and serve.